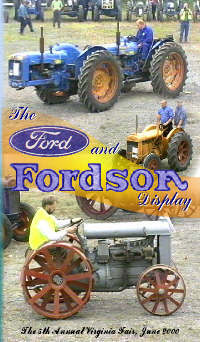 The Fordson story started in Detroit, Michigan, U.S.A.
where the Model F was built between 1917 and 1928. Some were also built in Cork, Ireland from 1919 to 1922. Next came the Model N. These were built initially at Cork in Ireland when production started in 1929, and later transferred to Dagenham in 1933. Nearly 250,000 were built by the end of production in 1945, of which some were exported back to the U.S.A.
1945 up to the closure of the plant in 1964. Power Major in 1958 and the Super Major in 1960. Not forgetting the Ford-Ferguson, which was built at Dearborn, Michigan from 1939 to 1947.
improvements made to the Fordson range of tractors between 1917 and 1965. Triple Doe Dual Drive, which was two Super Majors joined together. Also included on this video are some of the other attractions of the 5th Annual Virginia Fair. Running Time 70 mins approx.